The Diaz Festival in Mossel Bay is now a well-known event in the Southern Cape. 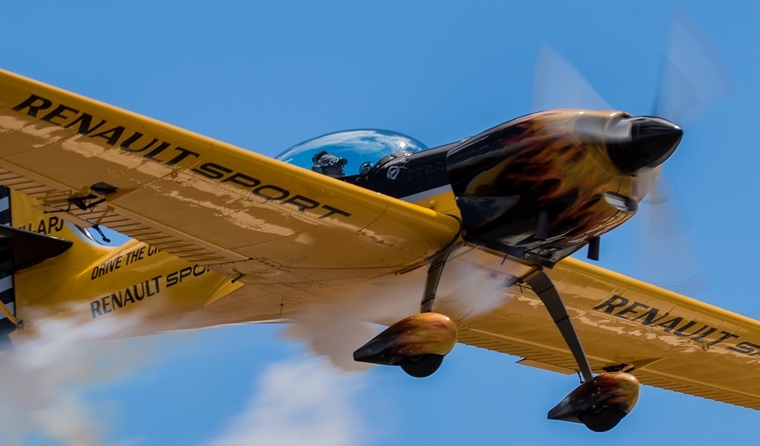 It is also the third year that the Western Cape Regional leg of the Aerobatic Championships was held concurrent with the airshow. This is a natural symbiosis as many pilots take part in both events, on the one side the pressure of competition, on the other the joy of showing your skill to a wider audience. This has its advantages on both time and travel distance for the participants. 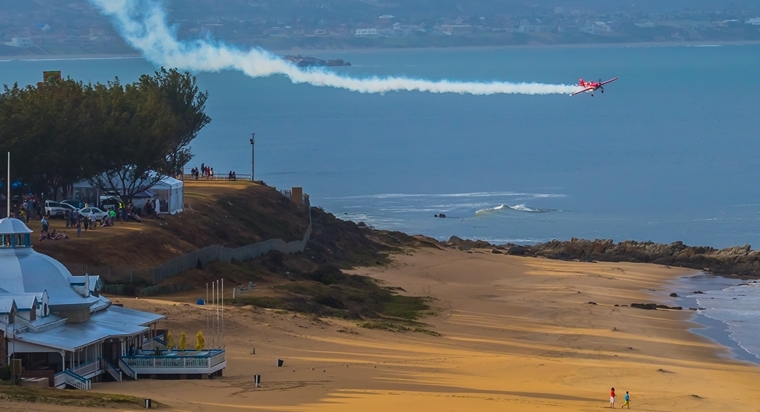 As owner of the festival the Mossel Bay Municipality were heavily involved and assisted the Mossel Bay Aero Club and the Sports Aerobatics Club with the organisation. 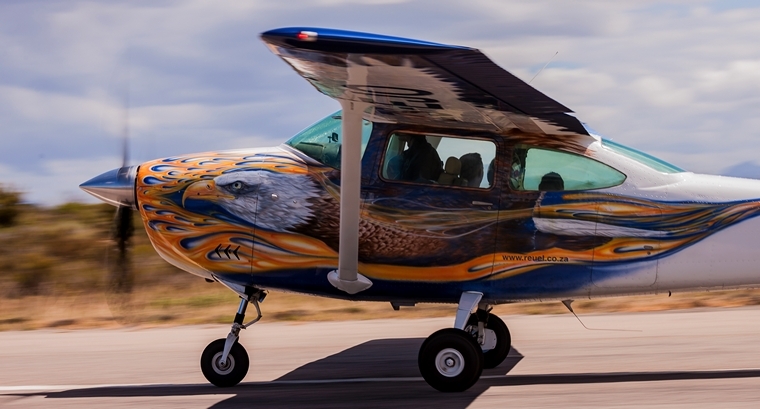 Mossel Bay is generally known for its good weather; that is until someone mentions flying. This year the weather was a mix of great to awful. The competitors who arrived early in the week to do some practice were blessed with great flying weather. Gradually the wind picked up on Friday and a nasty cold front arrived from the west, making flying virtually impossible on Saturday. Luckily the intensity came in cycles. One moment the airfield was shrouded in rain, but at the same time Charlie Marias, the Safety Officer, sitting at Santos Beach was shouting for aircraft to fill his program because the weather at his spot was good. Then the rain drifts over to the beach leaving the airfield partly cloudy, but rain at the display area. But the weather gods were showering favour too. A number of times the gap was such that most of the flying program could be squeezed in. On the aerobatics side the guys struggled as they needed a higher ceiling than for the displays. The Contest Director, Jacques du Plooy had his hands full to juggle the slots with the weather. In the end there was just not enough time to fly all 4 sequences with only the Free and the Known having been flown by all 11 contestants. In the Unlimited Class four pilots, Nigel Hopkins (MX2), Mark Sampson (MX2), Neville Fereirra (Slick 540), and Mark Hensman (MX2) competed. The Intermediate pilots were Jacques du Plooy (Yak 55) and Eugene Du Preez (Sbach). The RV Class were represented by Martin Venn and Wally Goodrich, while Andrew Blackwood-Murray (Zlin 50), Harry de Villiers (Zlin 50) and Conrad Botha (Slick 360) flew in the Sportsman Class. 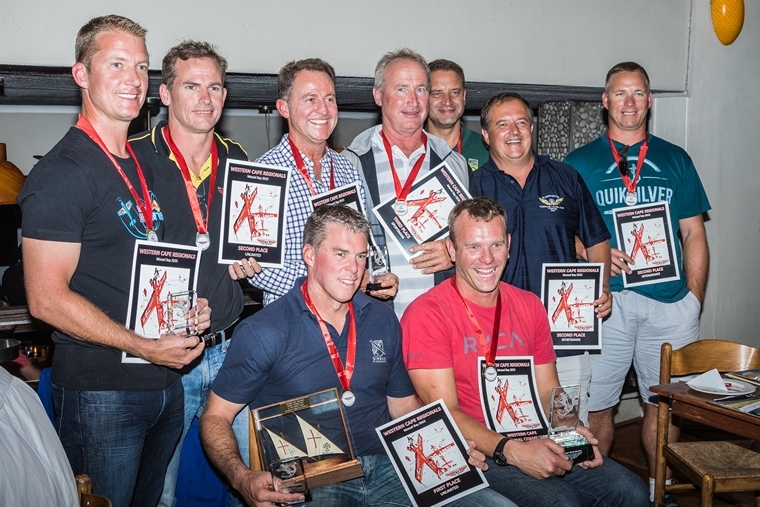 The award winners at the Western Cape Regional Aerobatics award function. L-r: Jacques du Plooy, Mark Sampson, Andrew Blackwood-Murray, Conrad Botha, Neville Fereirra, Wally Goodrich, and Eugene du Preez. Front: Nigel Hopkins and Martin Venn. RV - Martin Venn 1st. Martin also posted the highest score for the competition. Full results can be viewed on the SAC site at . 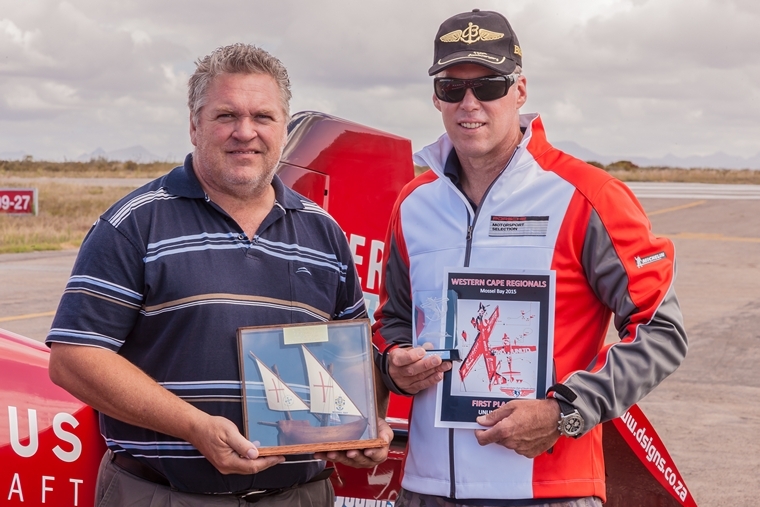 Mossel Bay Aero Club secretary, John Boucher, who handed over the Diaz Trophy on behalf of the Mossel Bay Municipality, with Nigel Hopkins, the first recipient. This year it was the first year that the Diaz Floating Trophy, awarded to the highest scoring pilot in the highest class competing was awarded. The trophy was sponsored by the Mossel Bay Municipality and was won by Nigel Hopkins. This trophy was handed over by John Boucher on behalf of the Mossel Bay Aero Club and the Municipality at the awards function held on Saturday night at a local seafood restaurant. On the airshow side a great deal of planning and co-ordination between John Boucher, Ramp Master, and Charlie Marias, Safety Officer, had to be done to assure a reasonable flow of aircraft over the festival area, yet taking weather conditions in two very diverse zone into consideration. This was done very well and most members of the public did not even realise the challenges these two gentlemen faced. This Cessna 172 RG, piloted by Mossel Bay Aero Club Chairman Roger Brink, was one of the local aircraft who did a fly pass at the beach. Andrew Blackwood-Murray in the Zlin 50. 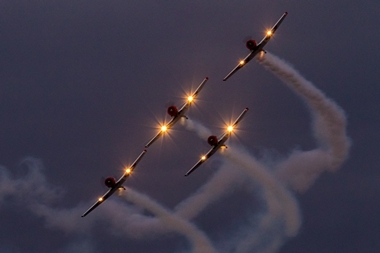 The star act for the Festival Airshow was the Flying Lions team of Harvards under leadership of Scully Levin. After much nail biting due to the weather they eventually arrived on Friday afternoon, just in time to refuel and be in ready for their sunset display slot. They were preceded by the duo of Nigel Hopkins and Mark Hensman in the two MX2s who had the crowd in awe with their flying stunts. Saturday morning the program was open by another star act, which needed much begging and fancy footwork by Airshow Program Co-ordinator, Horace Blok, to organise a fly pass of flight MN903, the Saturday morning Johannesburg/George Kulula flight. 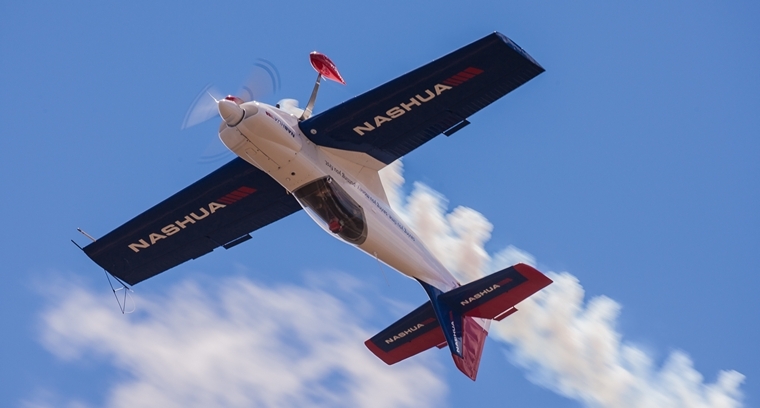 Regular passengers were wondering why they were taking a different route and much positioning until the crew of Kalahari Bierman, Clive Turner and Glen Warden informed them that they are actually participants in the Diaz Festival Airshow. On arrival at George Airport each passenger was handed a certificate of participation in the Airshow as a memento. Most of the pilots who had display ratings and were cleared by the Safety Officer had a change to display for the crowd. A few of the local pilots also did a flat flyby to keep the air above the festival area bussing. The day was suppose to have started with parachute jumpers, each carrying a flag of the countries of significance in Mossel Bay's history, but due to the weather this had to be postponed till later. 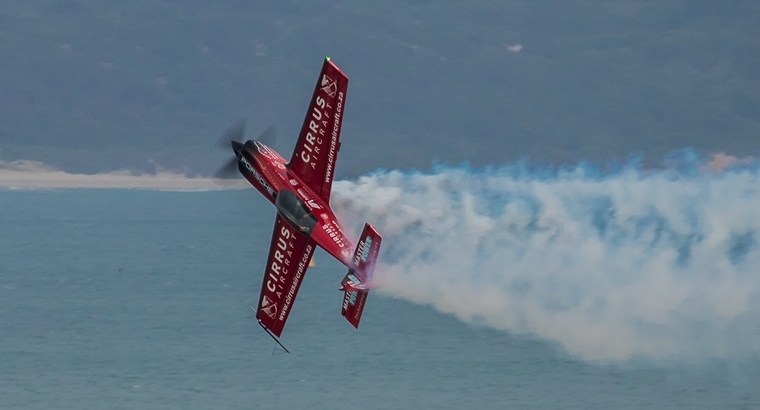 The crowd were also looking forward to see Patrick Davidson with the P51 Mustang, �Queen of Hearts�, but due to bad weather he could not make the trip. Cold starting of the Harvards means an early morning gym session. The Cessna 182 of Outeniqua Skydivers taking off with the flag jumpers. 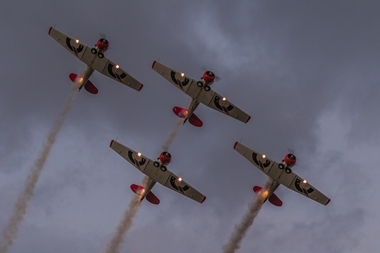 The public also got to see how the aviation brotherhood honours their fallen when a 5-ship flew a missing man formation for the late Cliffy Pike, who sadly lost his life last year on his way to this event. Although hampered by poor weather conditions the airshow was a great success, mainly due to good planning and a giant effort by all involved, from the organisers and sponsors, to the display pilots, who accepted the fact that the only firm thing was that their display slots were never firm. The Mosselbay Aero Club wishes to thank the numerous people and companies for their contributions ino make this yearly event a great success.